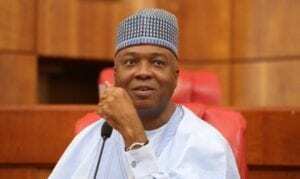 The Senate President, Bukola Saraki, has described the release of some of the abducted Dapchi Schoolgirls as a proof that the prayers of Nigerians have been answered. He said this in a statement signed by his Special Adviser on Media and Publicity, Yusuph Olaniyonu, where he also commended President Muhammadu Buhari, the Nigerian security forces as well as the government of Yobe State for the efforts that led to the release of the girls. Mr. Saraki further urged the federal government to ensure the return of the remaining Dapchi and Chibok schoolgirls. The Nigerian government had earlier confirmed the released of 101 of the 110 girls abducted by Boko Haram terrorists from a secondary school in Dapchi, Yobe State. The government initially said 76 girls were released Wednesday but later gave an update. Part of Mr. Saraki’s statement read, “The release of the abducted Dapchi schoolgirls is tremendous news for the country. Our prayers have been answered. “I commend President Buhari, our security forces and the Yobe State Government for their effort in bringing back our girls. However, we cannot stop here. We must not rest until all the Dapchi girls, and the remaining Chibok girls are back home with their families.